The color contrast between light brown heat/drought-stressed grass and the dark green fairy ring grass is just becoming evident. 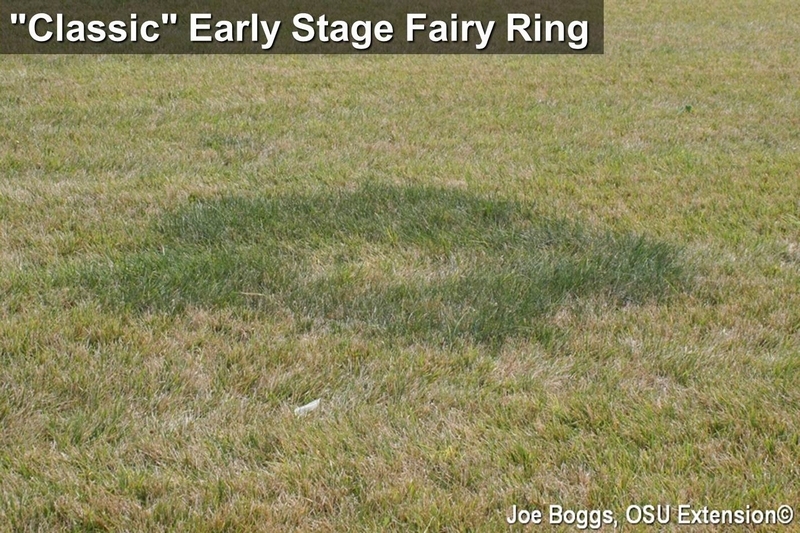 There is no "one size fits all" with fairy rings. They occur worldwide and involve multiple types of fungi depending upon location, plants affected, etc. Some occur in wooded areas, others in pastures, grasslands, and turfgrass. If a fairy ring develops in turfgrass, it's always there as an ever-expanding peculiarity; however, its appearance varies based on environmental conditions and stages of fungal development. In general, fairy rings may appear in three forms: a procession of mushrooms arising from the ring, usually in the spring -- the mushrooms are responsible for the fairy ring name; grass that's darker green and growing more rapidly than surrounding grass; or grass that has turned brown which is known as a "fairy ring collapse" with the affected turfgrass sometimes failing to recover. The rings may appear as distinct circles that measures less than 1' in diameter, to circles measuring hundreds of feet in diameter, to arcs or broken arcs crossing parts of a lawn or arcs across several contiguous lawns. Some old rings are so large they are only identifiable in aerial view. The width of the affected band grass is usually around 1'. Fairy rings in pastures, grasslands, and turfgrass continually expand, getting larger year-after-year. Controlling fairy rings is difficult. Fungicide applications have been successful in suppressing the rings on golf courses and there are appropriately labeled products available to both turfgrass professionals and homeowners. However, multiple applications are generally necessary and the experience and equipment required means control efforts should involve a turfgrass professional. Other methods to eliminate fairy rings focus on removal and replacement of the affected soil and sod. However, this can be a costly approach with some risks since even a small area missed during removal will fire the formation of a new ring. Indirect approaches to fairy ring management using proper fertilization and irrigation are more cost-effective. Following a consistent fertilization program will maintain the growth and color of surrounding grass to mask the fairy ring. Irrigation will also mask the color contrast between the ring and surrounding drought-stressed turfgrass and may prevent collapse. In the end, it should be remembered that rings in home lawns will continue to grow to eventually leave the affected lawn … and become someone else's problem.